Armin Shimerman (born November 5, 1949) is an American actor, voice actor and author. He is best known for his roles as Quark in Star Trek: Deep Space Nine, Principal Snyder on Buffy the Vampire Slayer, voicing Doctor Nefarious in the Ratchet & Clank series as well as Andrew Ryan in BioShock. Shimerman was born to a Jewish family in Lakewood, New Jersey, the son of Susan, an accountant, and Herbert Shimerman, a house painter. 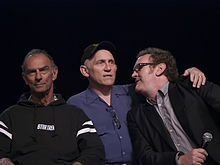 When Shimerman was 15, his family moved to Los Angeles, where his mother enrolled him in a drama group in an effort to expand his social circle. Shimerman attended Santa Monica High School and was active in drama. As a senior, he played leading roles in school productions of Hamlet, The Crucible and The Skin of Our Teeth before graduating in 1967. After graduating from UCLA, Shimerman was selected to apprentice at the Old Globe Theater in San Diego. Shimerman began pursuing a dramatic career in theater, eventually moving to New York, where he was a member of the Impossible Ragtime Theater. Returning to Los Angeles, Shimerman received roles in two CBS series, launching his television acting career. Shimerman is best known for his role as the Ferengi bar owner Quark in the long-running television series Star Trek: Deep Space Nine, though his involvement with the Star Trek franchise began with appearances as other Ferengi characters in the Star Trek: The Next Generation episodes "The Last Outpost" and "Peak Performance". As the character Quark, Shimerman became one of Star Trek's most widely known characters, and he appeared several times on the cover of TV Guide, either with other actors or alone as part of a collector's series. He says that his favorite episode of Deep Space Nine is "Little Green Men" as it was the only episode where he is shown captaining a ship. Along with Marina Sirtis, Jonathan Frakes, John de Lancie, Michael Ansara, and Richard Poe, he is one of only a few actors to play the same character on three different Star Trek series. He played Quark in Star Trek: The Next Generation, Star Trek: Deep Space Nine and Star Trek: Voyager. In addition to Star Trek, Shimerman has had roles as Pascal on Beauty and the Beast and as Principal Snyder in Buffy the Vampire Slayer. He also has starred in Stargate SG-1 as one of the Nox, an evil wizard in Charmed, appeared as Stan the caddy in an episode of Seinfeld and as Dr. Patemkin on Leverage. Shimerman has appeared as judge Brian Hooper in the third season of Boston Legal, joining fellow Star Trek actors William Shatner, René Auberjonois, and Ethan Phillips. His character even shared a scene with Auberjonois, with the strife between the two characters reminiscent of the conflict between Shimerman's Quark and Auberjonois's Odo. He made an appearance as "The Terror" in The Tick live-action series. He appeared in the series Numb3rs episode "Provenance" as an art expert. He also appeared in the episode "Posse Comitatus" of The West Wing as Richard III and had a cameo role in the film What the Bleep Do We Know!?. He has made appearances in television series such as Married... with Children, Warehouse 13, Tremors, Castle and Red Bird. He has voiced several video game villains, including Toad in X-Men Legends, Andrew Ryan in the BioShock series, Razputin's father in Psychonauts, and General Skarr from Evil Con Carne and The Grim Adventures of Billy and Mandy. He lent his voice talent to BioWare for their games Jade Empire (as Emperor Sun Hai) and Mass Effect (as the original Salarian Councilor). He also voices Emil Narud and Mohandar in StarCraft II: Wings of Liberty and the expansion StarCraft II: Heart of the Swarm. In 2008, he voiced the character of Wilmer in an audio dramatization of The Maltese Falcon that also featured Michael Madsen, Sandra Oh, and Edward Herrmann. In addition, he also voiced the character of Mr. Phillips in Focus on the Family Radio Theatre's production of Anne of Green Gables. He also voiced Raanu in the straight-to-DVD animated film Bionicle: The Legend Reborn. He also voices Green Goblin in the video game Marvel: Ultimate Alliance 2. In 2011, he provided additional voices for the MMORPG Star Wars: The Old Republic. In 2012, he also provided additional voice talent for the MMORPG The Secret World. His most well known voice role is that of Doctor Nefarious in the Ratchet & Clank franchise, a role he received much praise for. He reprised his roles as Doctor Nefarious and Andrew Ryan in the crossover fighting game PlayStation All-Stars Battle Royale. Shimerman co-authored a Star Trek: Deep Space Nine novel, The 34th Rule, with David R. George III, published January 1, 1999. It focuses on his character Quark, who loses his bar and is imprisoned as a result of a diplomatic crisis between the Bajoran and Ferengi governments. The novel is an allegory for the internment of Japanese Americans during the Second World War. Shimerman has co-written a series of books in which he provides a science fictional basis for the life of Dr. John Dee. The first novel in the series, The Merchant Prince, was co-written with Irish author Michael Scott, known for his Nicholas Flamel series. Published in 2000, it features the historical figure John Dee being placed in suspended animation in 1575 by an alien race known as the Roc and awakening in 2099. The cover features Shimerman in Elizabethan garb. Shimerman commented: "John Dee really did exist. We're pretty sure he was a member of Queen Elizabeth's secret service, which put it in his purview to kill if he needed to. The Elizabethan period was a much more perilous time; you had to be quick with a dagger and nefarious in order to survive". Shimerman thought there were aspects of both himself and his Star Trek: Deep Space Nine character, Quark, in the novel's interpretation of John Dee. Shimerman commented: "There are aspects of Quark similar to Dr. Dee, and undoubtedly there are aspects of Dr. Dee similar to Armin Shimerman, which would make him seem like Quark as well". The other novels in the series are Outrageous Fortune (2002), co-written with Chelsea Quinn Yarbro, known for her historical horror novels, and Capital Offense (2003). Shimerman is married to actress Kitty Swink. 1982 Hill Street Blues Phone Man Episode: "Heat Rash"
1983 Oh Madeline Norman Episode: "Chances Are"
1984 Cagney & Lacey Officer Green Episode: "Matinee"
1984 The Paper Chase Asphalt Expert Witness Episode: "Tempest in a Pothole"
1984 Remington Steele Nestor Bartholomew Episode: "Lofty Steele"
1985 Alice Man at Auction Episode: "Kiss the Grill Goodbye"
1985 I Had Three Wives Herb Episode: "You and I Know"
1985 The Facts of Life Mr. Smith Episode: "Out of the Fire"
1986 It's Garry Shandling's Show The Doctor Episode: "Garry Throws a Surprise Party"
1986 You Again? Jim Episode: "The Grad"
1987 What's Happening Now!! Frank Episode: "Mad Money"
1987 Easy Street Mr. Klinestabber Episode: "Frames and Dames"
1987 Crime Story Treasurer Episode: "The Pinnacle"
1987 Sledge Hammer! Malcolm Dench Episode: "Hammeroid"
1989 Hooperman Dr. Wexler Episode: "Nightmare in Apartment One"
1989 Duet Dr. Jordan Episode: "The New and Improved Linda"
1990 Who's the Boss? Mr. Warner Episode: "Road Scholar"
1990 Alien Nation Cyril Roman Episode: "Gimme, Gimme"
1990 Cop Rock Mersky Episode: "Pilot"
1990 Good Grief Stinky Episode: "Cub Scouts and Horses & Whiskers on Kittens"
1991 Married... with Children Mr. Lovejoy Episode: "Buck the Stud"
1991 Pros and Cons Harvey Episode: "Fire and Ice"
1992 Civil Wars Victor Sofransky Episode: "Mob Psychology"
1995 Star Trek: Voyager Quark Episode: "Caretaker"
1996 Seinfeld Stan Episode: "The Caddy"
1996 The Lazarus Man Henry Munroe Episode: "Jehovah and Son, Inc."
1997 Stargate SG-1 Anteaus Episode: "The Nox"
1997 Ally McBeal Judge Walworth Episode: "Boy to the World"
1999 Martial Law Daniel Darius Episode: "Slammo Blammo"
2001 Judging Amy Anthony Cara Episode: "The Undertow"
2001 The Guardian Judge Smitrovich Episode: "The Men from the Boys"
2001 Citizen Baines Robert Udelwitz Episode: "The Appraisal"
2001 The Agency Dr. Oliver Episode: "Nocturne"
2002 The Tick The Terror Episode: "The Terror"
2002 Charmed The Wizard Episode: "We're Off to See the Wizard"
2002 Boston Public Judge Semel Episode: "Chapter Forty-Four"
2002 The West Wing Richard III Episode: "Posse Comitatus"
2002 Thieves Professor Conrad Haglar Episode: "Home Is Where the Heist Is"
2003 Tremors Cecil Carr Episode: "A Little Paranoia Among Friends"
2004 Crossing Jordan Dr. McCain Episode: "Slam Dunk"
2004 ER Levine Episode: "Where There's Smoke"
2004 Nip/Tuck Ocularist Episode: "Natasha Charles"
2005 Committed Super Episode: "The Snow Episode"
2005 Justice League Unlimited Dr. Achilles Milo (voice) Episode: "The Doomsday Sanction"
2005 Joan of Arcadia Ronald Harbison Episode: "Trial and Error"
2006 Ben 10 Slix Vigma (voice) Episode: "Grudge Match"
2006 Dr. Vegas Clown Episode: "Heal thyself"
2006 Numbers The Art-Authentication Board Member Episode: "Provenance"
2006 South of Nowhere Dr. Crawford Episode: "That's the Way the World Crumbles"
2009 Leverage Dr. Patemkin Episode: "The Juror #6 Job"
2010 Warehouse 13 Charlie Martin Episode: "Where and When"
2012 Perception Dr. Cutler Episode: "86'd"
2012 Castle Benjamin Donnelly Episode: "The Final Frontier"
2013 CSI: Crime Scene Investigation Oscar Episode: "Check In and Check Out"
2014 Franklin & Bash Stu Weston Episode: "Falcon's Nest"
2016 Timeless David Rittenhouse Episode: "The Capture of Benedict Arnold"
2016 Uncle Grandpa Additional Voices Episode: "The Phone Call"
2017 Justice League Action Zilius Zox (voice) Episode: "Rage of the Red Lanterns"
2018 We Bare Bears Additional Voices Episode: "Best Bears"
^ "Armin Shimerman Biography (1949–)". Filmreference.com. Retrieved 2012-08-02. ^ "Recalling "Yesterday's Enterprise" with Eric Stillwell - Part 2". Star Trek.com. February 18, 2011. Retrieved August 11, 2013. ^ a b Dilmore, Kevin (2001). "Star Trek Communicator issue 130". Fantastic Media. Denver Colorado: 59. 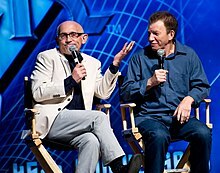 Wikimedia Commons has media related to Armin Shimerman. An Interview with Armin Shimerman by Buffering the Vampire Slayer, A Buffy the Vampire Slayer Podcast, 19 November 2016. This page was last edited on 9 April 2019, at 15:20 (UTC).